Brandon Cloyd (Communication ‘07) performs in a Barrel of Monkey’s Matinee performance. He will direct a new round of the company’s matinees which opens Feb. 14. A Chicago theater company hopes to break down socioeconomic barriers by working with Chicago Public Schools students one story at a time. The company, Barrel of Monkeys, will present its latest series of Sunday matinee performances, directed by Brandon Cloyd (Communication ‘07), starting Feb. 14. 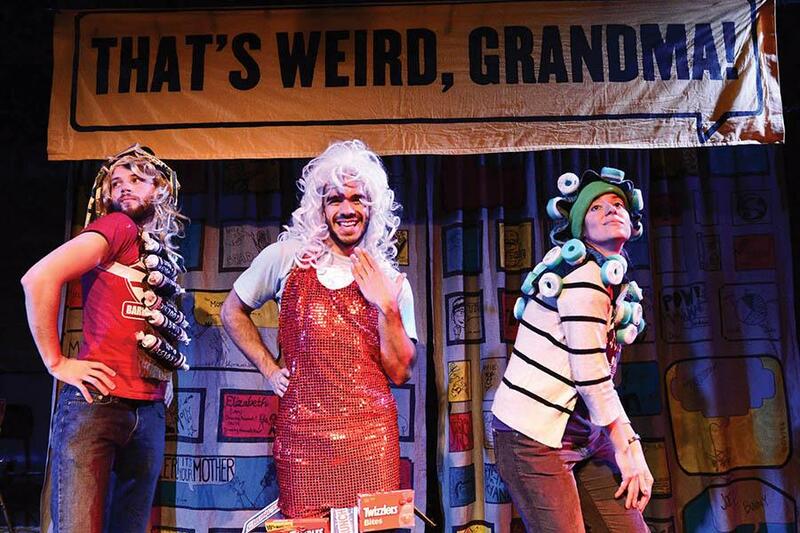 The series, titled “That’s Weird Grandma: Winter Wonderland Matinees,” features a variety of professional sketches and songs all adapted from CPS students’ original stories. The upcoming series will feature light-hearted sketches — like the story of a character made of bacon who is getting an F- on his report card — with more serious numbers, like one featuring a ballet dancer running through the snow, Cloyd said. Music will be intertwined throughout the show in various styles depending on what the musicians choose to do in adapting the stories. Cloyd said he first heard about Barrel of Monkeys in a Northwestern theater class as an undergraduate student and thought it sounded like an interesting opportunity. He said he then saw a Barrel of Monkeys show and was very impressed, inspiring him to take more classes involving storytelling and children’s theater. Once he graduated, he was set on the idea of working with education and theater, Cloyd said. Cloyd joined Barrel of Monkeys in 2007 as a performer and has remained with the organization in various positions ever since. This is his first time directing a round of the company’s matinee series, which has run year-round for the past 15 years, except for a brief break this month. Since its founding in 1997, Barrel of Monkeys has worked in 60 CPS schools with a focus on the creative process in the classroom. More than 8,000 lower-income elementary school students have participated in its programs, which offer them a chance for creative expression in the form of storytelling. The company holds creative writing workshops in third to fifth grade classrooms and requires students to write several stories. By the end of a season of workshops, students altogether will have written around 900 stories, Schupbach said. It is up to the teachers and performers to narrow down these stories to around 20 to be adapted and performed. The stories are then presented in different art forms in school shows or public shows, like “That’s Weird Grandma.” Although general artistic interpretations may vary, the artists and performers in the ensemble try to stay as true as possible to the original story, Cloyd said. One great thing about the program is that many of the teachers are also performers, Cloyd said. Because of their closeness to the classrooms, the teachers are able to tell the other actors about the kids so they adapt with an insight into their personality, he added. Everyone, from clowns to musicians to improvisers to dancers, contributes to the program’s work. These professional artists make the stories written by elementary school students accessible to anyone, no matter their age, Schupbach said.